With another eventful and productive year under our belt, the State of the City Address presents us with the opportunity to look back on what we have accomplished as a City. But the beginning of a new Term of Council is a particular occasion to take a forward-looking view and acknowledge the challenges and opportunities that lay ahead for our city. And there are a number of important projects waiting for us this term: the launch of the Confederation Line and the beginning of construction on Stage 2, as well as a review of our Official Plan and Transportation Master Plan, a strategy to manage our solid waste, and a Ward Boundary review. Thankfully – we as a Council are presented with the privilege of working together over the next four years to address many of these challenges and improve our community and the quality of life of our residents. But before I start, I want to take a moment to acknowledge that we are on the unceded territory of the Algonquin People, who have lived on these ancestral lands for millennia. I value our relationship with our surrounding Algonquin communities – Pikwakanagan and Kitigan Zibi – as well as with all First Nation, Métis and Inuit residents of Ottawa. And I want to welcome Chief Kirby Whiteduck from Pikwakanagan who has joined us today. It’s important for me to have our Indigenous partners present at these events. It speaks not only to our ongoing friendship – but also to the City’s efforts to deliver on our country’s reconciliation efforts. And I was proud when Council adopted last year a complete Reconciliation Action Plan and Statement of Reconciliation, which aligned with the Truth & Reconciliation’s calls to action. I believe it’s the least we can do to live in solidarity with our Algonquin neighbours and to begin to right the wrongs of the past. And we’re continuing this great collaboration on many levels. Just in November, we announced that the City and Ottawa Tourism had worked with Chief Whiteduck’s community and Indigenous Sport and Wellness Ontario to deliver on a number of initiatives that will promote Indigenous wellness through sport, leadership and community development. As part of this agreement, Ottawa will have the honour of hosting the 2021 Ontario Indigenous Summer Games, as well as the 2021 and 2023 Masters Indigenous Games – which we are thrilled to welcome to our city. Hosting these prestigious Games will give our residents the opportunity to learn more about Indigenous culture, as well as celebrate it. Nous avons hâte de célébrer la culture autochtone avec les milliers de participants qui viendront à Ottawa pour ces événements. As we all know, these major events are important to Ottawa’s economy and help sustain good jobs in our hospitality industry. As I look back on the success of our tourism sector over the past year, it’s almost unfair to compare it to 2017 – when we celebrated Canada’s 150th anniversary. Our city and its Ottawa 2017 initiative had delivered a very successful program of events that captivated and excited our residents – and the more than 11 million tourists who chose to visit our nation’s capital that year. In fact – 2017 was so successful that many believed a significant tourism hangover was almost inevitable in 2018. But despite those early fears, our partners at Ottawa Tourism are excited to report an increase of more than four percent in hotel demand over 2016 – an important achievement for our tourism sector. And we have heard the same message from the Ottawa Airport, where passenger numbers were up 5.6% over 2017 – a new record for the airport. And it’s hard to ignore the importance of this activity following the release last week of Ottawa Tourism’s economic impact study. The numbers point to more than 43,000 direct and indirect jobs that depend on a healthy tourism sector in our city. This adds $1.4 billion dollars to the GDP – or over $3.8 million that are generated every single day because of Ottawa’s visitor economy. Michael Crockatt and his team at Ottawa Tourism are always hard at work promoting Ottawa as a destination. They also ensure we keep up the momentum by attracting major sporting events and conferences to Ottawa. And with the new Hotel Tax in place, they now have the resources to compete aggressively on the world stage for these events. The University Sports Women’s Soccer Championships, in which uOttawa came out victorious on home turf. the University Sports Women’s Rugby Championships. Simply between these four events, Ottawa will welcome approximately 3,500 athletes– in addition to coaches, officials, and family members – most of whom will stay in hotels, and eat and shop locally. And with the work of Sports Commissioner Mathieu Fleury, we hope to announce more major sporting events this term of Council. And there are many other great reasons for tourists to visit Ottawa this year – with our tourism and cultural sectors marking a number of milestones in the coming years. The National Arts Centre turns 50 this year – and the NAC team is celebrating by launching its new Indigenous theatre program. La Nouvelle Scène – qui abrite quatre compagnies de théâtre francophone dans ses nouveaux locaux sur la rue King Edward – aura à son tour 20 ans cette année. Bluesfest and Chamberfest will both be celebrating their 25th season – and Music and Beyond is marking its 10th anniversary in 2019. In 2020, the world will be marking the 75th anniversary of the liberation of Holland during the Second World War. As you know, during that difficult time for the Dutch people, their royal family found refuge in Ottawa. In fact, Princess Margriet was born in 1943 at the Ottawa Civic Hospital, where a federal proclamation declared the maternity ward to be Dutch land, ensuring that the new princess would only be a Dutch, and therefore eligible to the line of succession to the throne. These events are behind the special relationship that Canada has with Holland – and it’s the reason why that country still sends the 20,000 tulips that come to life and add colour to our city every spring. I have written to Prime Minister Trudeau and Minister Freeland to encourage them to invite the King and Queen of the Netherlands to visit Ottawa in 2020, so we can appropriately celebrate these momentous events. Now as many of you know, Centre Block has now closed for over a decade to undergo significant renovations – which means that a generation of school children coming to Ottawa won’t have access to the building they know as Parliament. But I’m confident that visitors will have exciting new experiences discovering the temporary homes of the House of Commons in West Block – and of the Senate, inside the old train station. And let’s not forget the many other City-led projects that make Ottawa not only a great destination – but also a more liveable city for our residents. This past spring, we opened the new Ottawa Art Gallery – a world-class arts facility that has quickly become a visitor attraction, even getting praise from the New York Times. And although it was not a full year of operations, the OAG is thrilled to report that they welcomed a record 230,000 visitors in 2018 – more than double their projections. And although I’m excited by these numbers, I’m not necessarily surprised. Just last week, I attended an event hosted by the Ottawa Cultural Alliance, where they are hard at work developing our city’s next cultural roadmap. The Cultural Alliance used this session to share results of a recent study showing that 90% of Ottawa-Gatineau residents are attending and participating in cultural events. This participation rate not only exceeds the national average – it shows that we fare better than seven other large Canadian cities. I think that’s a promising sign for our city’s arts and culture sectors over the coming years. Another encouraging sign is the increase in the number of murals across our city – as many residents are also showing their enthusiasm for these public art displays. Last fall, Stirling Avenue resident Sara May had a mural of her three-year-old French bulldog Imelda, posing with flowers, painted on the side of her house in Hintonburg. After she was asked by Bylaw to repaint over it, Councillor Leiper and I intervened at Council to save the beautiful mural that was animating and bringing joy to this neighbourhood. This year, as staff will be reviewing the Permanent Signs on Private Property By-law, I have asked them to find an easy process to provide exemptions when appropriate, so we can encourage this non-commercial type of public art – which makes our city more appealing and more liveable. Another one of our city’s growing attractions is Lansdowne Park. Since its revitalization, Lansdowne has become one of our city’s great destinations and an important economic generator – not to mention a great source of pride and entertainment for all. And our residents will soon have more options to get to this site, once the Flora Footbridge opens in the fall of 2019. This exciting addition to our transportation network will make it easier for pedestrians and cyclists to get to Lansdowne – and it will increase connectivity between neighbourhoods. This $21 million dollar project is a great example of what we can accomplish when all three levels of government work together to fund important infrastructure projects. And I want to thank Minister Catherine McKenna and then provincial minister Yasir Naqvi for delivering on this exciting project that will greatly benefit residents and visitors alike. Although it’s still a few years away, we continue to make progress on our new Central Public Library project – working with our partners at Library and Archives Canada. This is an important initiative for our community, as the relevance and need for libraries in Ottawa is greater than ever. OPL Chair Tim Tierney tells me that last year alone, the Ottawa Public Library registered an impressive 4.4 million in-person visits. In November, we announced that the respected team of Diamond Schmitt Architects and local firm KWC Architects had been chosen as the successful proponent to design the new library. Witnessing the exceptional work they did on the revitalization of the NAC and the new Senate of Canada Building – I’m very excited to see what iconic building they will propose for our new central library. 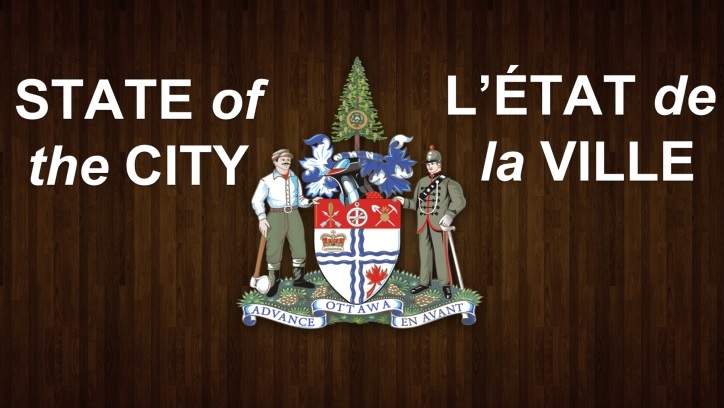 The community consultations on this great city-building project are going to start at the end of February. The exact details will be announced soon – and I encourage you to come out in great numbers to let the designers know what functionalities you would like to see in this building. I’m also pleased that we will begin planning for the new library in Riverside South this year – which I look forward to seeing open in 2021, as I know Councillor Meehan does as well. And thanks to all these exciting investments in our city, confidence in our economy continues to grow. Last spring, Ottawa’s unemployment reached its lowest levels in many decades, dropping as low as 4.2 per cent in April – the lowest it’s been in 30 years. Since then, we’ve delivered on three more projects that will help us diversify our economy and create thousands of more jobs across Ottawa. In May, we approved Hard Rock’s expansion plans for the Rideau Carleton Raceway in the south end. This $320 million project will create approximately 3,100 construction jobs and close to 900 permanent jobs, up from the current 400 employees. In July, I was pleased to confirm the arrival of Amazon to the city’s east end, with the construction of its new fulfilment centre on Boundary Road. Not only will Amazon create more than 600 full-time jobs in Ottawa when it opens later this year, the construction of the facility itself is providing work to 1,500 residents. Amazon créera 600 bons emplois pour nos résidents dans l’est de la ville. At the NCC Board meeting in November, we approved a $40-million dollar soundstage campus and creative hub project that will be built across the street from the Nepean Sportsplex. I’m proud to have worked with Ottawa’s Film Commissioner Bruce Harvey and TriBro Studios – with the support of Councillors Egli, Harder and Cloutier – to bring forward this proposal. The project will create approximately 500 full-time jobs during construction, and over 500 new full-time jobs in film, TV and animation in its first few years of operation. And thanks to Councillor Harder’s leadership, we will soon launch on this same NCC property – which contains 16 kilometres of roads – an autonomous vehicle test track where we can safely test these cars of the future away from other road users. This project will also support the development of products and technologies to advance precision agriculture – cutting-edge agricultural practices that lead to higher crop yields and a lower environmental footprint. And speaking of the NCC, I remain hopeful that this year, the partners looking to redevelop LeBreton Flats will successfully negotiate with the NCC so we can finally see a start to this project, which would create thousands of new jobs in our city. And with the Canadian Tire Centre potentially moving downtown, we must be aware – as I know Councillor Gower is – of the need to ensure we do our best to help fill the void that will be left with that move. And I’m quite proud that we’ve been able to help deliver these thousands of well paying jobs for Ottawa residents while maintaining the City’s books in order. Nous avons aidé à livrer ces milliers d’emplois pour nos résidents en maintenant une discipline fiscale à l’hôtel de ville. As you all know, keeping taxes low and the city affordable for all has been one of my top priorities during my time at City Hall. I’ve always believed that this fiscal discipline helps our seniors on fixed incomes, young couples looking to buy a home, and small businesses dealing with rising costs. As I always say: we must be part of the solution to help our residents and small businesses – not part of the problem. This is why in the last election, I committed to helping restaurants that bring so much liveliness to our neighbourhoods by reducing their patio fees by 50 percent. This reduction will save restaurants paying patio fees an average of $3,200 per year. And I’m proud to say I will be bringing forward this proposal in the upcoming budget, so we can lend a hand to some of our city’s hardest working entrepreneurs. I also committed to helping reduce costs for our city’s festivals, who count on our help to make their event a success. One comment I often hear from festival organizers is that their security and policing costs are consistently going up. That is why I committed to working with the provincial government and with the City’s emergency services staff – who oversee our Special Events Bylaw – to bring in changes that will allow festival organizers to use more public safety professionals and fewer paid-duty officers to oversee security at their events. This would allow festivals to save on security costs, freeing up funds to reinvest towards artists and musicians. We all know these festivals play an important role in defining our city’s cultural identity and making it a great destination. They also support our growing music industry and the musicians, producers and venues that can truly transform Ottawa into a music city. With that in mind, Council approved last year the first ever Ottawa Music Strategy – thanks to the leadership of Councillor Jeff Leiper – a plan that identified opportunities and targeted investments to help grow this promising sector. And we’re already seeing investments happening based on our community’s enthusiasm for music. Just think of the latest addition to Queen Street – right next to the Parliament Station of LRT. Queen Street Fare has quickly become a popular food hall and music venue in the heart of Centretown – with live music acts that entertain crowds almost every night. And they were the first venue to purchase the City’s new Musician Loading Zone permit – which allows musicians to unload their instruments in convenient nearby locations – making the venue attractive to artists. And this is just one of the transformations that’s taking place on Queen Street, as Michael Curran recently pointed out in the Ottawa Business Journal. ‘’The NAC and the super library will neatly bookend Queen Street, creating a much more lively corridor than ever before. Now we know that a thriving cultural and music scene is always key to attracting young and promising talent to Ottawa – and there’s already a lot of it. I’m especially proud of the inspiring start-ups that are coming out of Bayview Yards since it opened in late 2016. With the help of Michael Tremblay and his team at Invest Ottawa, we are helping to launch and grow the next generation of local entrepreneurs. I’m sure many of you tuned-in to the Dragon’s Den on CBC a few weeks ago to witness the successful $250,000 deal that The Growcer’s Corey Ellis and Alida Burke struck with two of the dragons. The Growcer – with its state-of-the-art food growing system inside a sea container – is a true local success story – and I applaud them on their continued accomplishments. And the City also plays a role in fostering innovation from local start-ups. For a few years now, Economic Development staff have been facilitating the innovation pilot program –which was initiated by Councillor Allan Hubley to test new products and technologies within City services. For their part, Safety Labs has created a sensor technology that protects residents living with dementia from wandering off to unknown locations – and this product will be tested in the coming months at the Peter D. Clark Long-Term Care home. I look forward to seeing the results of these pilot projects and I hope we will be able to help these local companies grow along the way. Now I get to witness many more of these success stories when I’m out in the community. Just last year, I had the opportunity to visit a number of businesses to learn more about what they do and how they strengthen our local economy. Like Mercury Filmworks and Jam Filled Entertainment – two very successful animation firms who employ approximately 500 residents in Nepean. And a little known fact about Mercury Filmworks is that they animate the new episodes of the most popular animated character of all times: Mickey Mouse. Who would’ve thought Mickey Mouse would ever set foot in Ottawa – let alone come to life in our city? And some of the excitement and growth in our animation sector is already attracting other players to Ottawa. Just in December, Vancouver’s Atomic Cartoons setup shop in Hintonburg, opening an office with a team of approximately 15 animators and creative minds. But they are seeing the growth opportunities in Ottawa – and given our rich pool of animation talent – they are hoping to increase that headcount to 200 employees in no time. And employment numbers are also increasing in one of our city’s thriving industries: high-tech. Just this past summer, commercial real estate brokerage firm CBRE ranked Ottawa as Number 1 in North America for having the tech industry with the most momentum. From the Shopify and Klipfolio offices bursting at the seams downtown, to the increasing activity in the Kanata North Business Park – something Councillor Sudds is very familiar with – there is no doubt that Ottawa’s tech economy is thriving. True to their hashtag ‘’Success Happens Here,’’ the Kanata North Business Association recently released an economic impact study that put in perspective the contributions of their more than 500 high-tech members. The study revealed that Kanata North’s 33,000 employees contributed an impressive $13 billion to Canada’s GDP last year, up 66% from 2015 – and there’s no signs of slowing. And with already so much activity happening in Kanata, a number of tech companies are turning to the downtown core for office space and to attract the next generation of talent – something we’ve never seen before. And this trend could extend even further east, thanks to the arrival of LRT and vacancy rates that are expected to trend even lower in 2019. Developers and property managers like Colonnade Bridgeport are predicting that LRT could increase demand for office space in the east-end, where vacancy rates tend to be higher and rental fees lower – and I know Councillors Dudas and Luloff are working to ensure LRT helps bring greater economic prosperity to Orléans. This presents opportunities for government and businesses looking to control costs, as well as east-end residents looking for employment opportunities closer to home. We know that Ottawa is performing strongly – but we have to ensure that decision makers at all levels of government know this as well. Which is why on February 26, I will lead a delegation to Toronto, where we will host Ottawa Day at Queen’s Park to raise awareness with provincial ministers and MPPs. With the assistance of Minister Lisa MacLeod, I will be joined by Ottawa’s business, tourism, education and health leaders – so that we can promote our city’s accomplishments and advocate for its continued success. I look forward to meeting with Premier Ford and members of his government to share Ottawa’s success stories ahead of the provincial budget. Through the flurry of economic growth taking place in Ottawa, we as a Council must ensure that those opportunities benefit residents in all parts of the city. So let’s not forget the about the important jobs that exist in rural Ottawa – many of whom help feed our families every day. As you all know, 80% of Ottawa is rural and agricultural lands. Last year, I visited Berton Farms – a dairy farm in Sarsfield – with Councillor Blais, to witness the impressive modernization of today’s farming operations. Owned by the Van Munsteren family, this farm is one of 1,045 farms you will find while exploring the rural corners of Ottawa – and it’s at the heart of our agricultural economy. I also visited Carleton Mushroom Farms in Osgoode with Councillor Darouze – an impressive operation that brings many types of mushrooms to restaurants across the city. And we have other types of farms too – like the Mississippi Mills Solar Farm in Councillor El-Chantiry’s ward – which plays a key role in producing clean, renewable energy that it supplies to Ontario’s power grid. The City has recognized the importance and opportunity that presents our rural economy. And that’s why I’m proud that later this year, our economic development staff will be coming forward with a comprehensive rural economic development strategy. This document will guide our efforts to bring jobs to the rural villages of Ottawa throughout this term of Council. And with our ever growing population, we need good jobs in every corner of the city. In the weeks preceding Canada Day, we will achieve an important milestone in the life of a city – when Ottawa surpasses one million residents. Although we will confirm this date in a few months, I’m excited by the prospects of planning for a city of over a million residents. This milestone – along with the launch of LRT – will put us in another league amongst cities worldwide and will bolster our image on the world map with visitors. And if we want to think even a bit further out: in 2036, the population of the entire National Capital Region is expected to reach 1.8 million residents. That’s about where Vancouver was when it hosted Expo 86, and Montreal for Expo 67 – pointing to more opportunities to host large-scale events and excel globally in tourism. And I’m encouraged that we are laying the foundations for this growth with continued investments and confidence in our tourism industry. In 2018, close to 1,000 new hotel rooms were added to the market – ranging from Le Germain at the Ottawa Art Gallery, to a number of hotels at the airport and in Kanata. In 2019, we expect another 300 hotel rooms to come online to meet the increasing demand. Having now reached the five-million threshold in 2018, the Ottawa International Airport is planning for its continued growth and will be investing $25 million over the next few years to modernize its terminal and food concessions. It was also announced earlier this week that a $40 million ALT Hotel with 180 rooms will be built directly at the airport, with an indoor connection to the terminal. In addition to this, the Airport will also be building an LRT station directly inside the terminal. And due in part to these investments, the Conference Board of Canada recently projected that Ottawa’s tourism sector would grow by about 2.4% in 2019 – and then by at least 2.3% each year between 2020 and 2022. Among other things, the Conference Board report also pointed to the launch of LRT and its link to the Ottawa Airport as factors contributing to this strong upward trend. And it will not be the only economic benefit of LRT – our city’s largest and most ambitious infrastructure project since the opening of the Rideau Canal in 1832. Although I would have liked to launch the Confederation Line in 2018, I am encouraged by the progress that Transportation staff have recently reported. And over 1,000 CCTV cameras are now connected and already monitoring the system. The construction of LRT is creating thousands of good jobs and making people more confident to invest in their future in Ottawa. I’m excited that we’ll soon launch the first stage of this transformational project – and I’m proud that we’re already planning for Stage 2. This second phase of LRT will create 21,000 person years of employment and $4.5 billion in economic benefits to our city. It will also strengthen our reputation as one of the best cities in which to live and invest in North America. • farther west to Algonquin College, Bayshore, Moodie Drive and the new DND complex. In December, Treasury Board approved the City’s purchase of federal lands along the Stage 2 corridor – lands that are necessary to proceed with the construction project. I’m excited to report that a meeting of the Committee of the Whole will be held on February 27 to approve the procurement of Stage 2 of LRT. That means we will see shovels in the ground this spring on the Trillium Line extension – helping us maintain the momentum we have started with the construction of the Confederation Line. And we won’t stop there, having already laid the groundwork to keep extending the system to Kanata-Stittsville and Barrhaven in Stage 3 of LRT. The Kanata-Stittsville EA was completed and approved by Council last spring – and so we are ready to develop that western rail corridor once funding becomes available. And earlier this week, Ontario Environment Minister Rod Phillips called me and signed off on the EA to go ahead, and I’m very pleased with this step forward. I’m also pleased to announce that later in 2019, the City will consult with residents on the future names of LRT stations that will be built as part of Stage 2. And at the request of Algonquin College, we will be proposing that Baseline Station be renamed Algonquin Station. This makes perfect sense, given Algonquin’s recognition as one of our city’s respected postsecondary institution and its role as a major hub in the west-end. Having a world-class public transit system is critical to continuing to attract major international business and talent to our city. Un système de train léger de classe mondiale nous aidera à attirer de nouvelles entreprises et du talent à Ottawa. Now as a Council, we need to ensure that these historic transit investments benefit all residents – especially those who need it most. That is why we introduced the EquiPass and EquiFare in 2017 – to offer our low-income residents access to transit services at a 50% discount. The EquiPass costs $58 monthly, approximately half the price of Toronto’s low-income transit pass, which costs $116 per month. This saves pass holders approximately $700 every year. Cette mesure nous permet de bâtir le type de ville que nous voulons tous – une ville qui aide ses résidents dans le besoin à profiter du transport en commun de façon plus abordable. By the end of 2018, more than 11,000 residents had registered as eligible EquiPass users. And on average, more than 4,000 low-income residents benefitted from their monthly subscription to the EquiPass – an increase of 25% over the 2017 average. This is in addition to the 223,000 trips that were made in 2018 using the single-ride EquiFare. These numbers clearly point to the success of this initiative – but also to the need for this program in our community. Wanting to do more to help our seniors – who often find themselves on fixed incomes, I committed during the last campaign to extend the popular no-charge transit service to Sundays – in addition to Wednesdays. I believe this is more than a simple cost saving measure for seniors. It will encourage them to get out and engage in social outings – helping to fight the isolation that affects many in our community. Unfortunately, many seniors also find themselves on the City’s affordable housing waiting list. And this is an area where the City needs to do more to help its residents and families in need. Thankfully, between 2018 and 2022, approximately 750 new units will have been added to our affordable housing stock – as a result of both public and private partnerships. We must seek even more opportunities to help our low-income residents find a roof. And with the launch of LRT – we now have a once-in-a-generation opportunity to locate a number of affordable housing projects on public lands near transit stations. Capitalizing on this opportunity would really give a leg up to our low-income families who need both affordable housing and affordable transit to meet their family’s needs. I strongly believe this would position Ottawa as an affordable and truly compassionate city. The City’s Transit-Oriented Development Working Group – struck last year to identify these affordable housing development opportunities – has been hard at work to produce the list of priority sites within walking distance of LRT stations. Under Steve Willis’s leadership, the Working Group has identified five public sites prime for development in this term of Council – a list he will be presenting to Committee and Council in the spring. In the meantime, I’m pleased to announce that the first site that will be prioritized by staff is 557 Albert Street – which is located between LRT’s Pimisi Station and our future Central Library at LeBreton Flats. I look forward to seeing the detailed results of this work – and how these affordable housing projects will help our community’s residents in need. Now beyond these investments in housing, we will also be investing significantly in our city’s roads and infrastructure in this term of Council. As I made my way to more than 10,000 doors to hear from residents during the last campaign – and I’m certain that all Members of Council heard it as well: the condition of our roads and infrastructure was a priority for an overwhelming number of residents. La condition de nos routes et de notre infrastructure est une priorité dans plusieurs communautés. And with the 3% tax target that Council supported in December, we will be able to invest an additional $9.8 million this year towards infrastructure renewal projects – including roads, sidewalks, paths, culverts and bridges – in all parts of the city. This means we will invest $340 million towards roads and infrastructure in 2019 – and a total of $1.4 billion throughout this term of Council. At this rate, the existing infrastructure funding gap will be eliminated in five years instead of 10. À ce rythme d’investissement, nous pourrons éliminer le déficit d’infrastructure de la Ville en cinq ans. I’ve heard the concerns of residents – and I believe they are prepared to pay a bit more to have better roads and infrastructure in their community. I also look forward to making investments to keep our communities safer. As you know, we can’t achieve this without the great work of our women and men in uniform – whether to fight drugs and gang violence on our streets, or assist fearlessly during emergency events. First responders play a critical role in keeping our children and families safe. And somewhat unfortunately – we have seen their professionalism, dedication and effectiveness over and over again over the last few years, as our city was struck again. In September, the Ottawa Police, paramedics and firefighters were called to the scene of devastating tornadoes that touched down in the communities of Dunrobin, Nepean and Ottawa South. Earlier this month, they responded heroically and provided assistance, care and comfort to those affected by the horrific Westboro bus collision, which took the lives of three residents, injured 23 others, and shocked our entire city. Through these incredibly stressful events, our first responders continued to show poise and resolve – and with the support of many City staff, they consistently help our community get through the difficult times. And because the challenges are not getting any smaller – we will continue to hire more police officers and paramedics throughout this term of Council, which I will address during the 2019 Budget next week. Now technology can also play a crucial role in making our neighbourhoods safer – and we have seen this with the success of the Red Light Camera program. In the last election, I committed to installing 20 new Red Light Cameras, in addition to the current 54 cameras that already increase the safety of all on our roads. Red Light Cameras have led to a reduction of more than 50 percent in dangerous T-bone collisions, as well as a decrease of 43% in injuries. I’m also proud to say that the revenues from these cameras help us fund more road safety initiatives in neighbourhoods across the city. This term of Council, we will be piloting speed infraction cameras in school zones – with the goal of eliminating dangerous driving and protecting our community’s children. As a City, we’ve also invested in initiatives that help us protect our environment for these future generations of Ottawa residents. Construction on the Ottawa River Action Plan’s most important project – the Combined Sewer Storage Tunnel – has made significant progress. The North-South Tunnel was completed this summer – a major milestone that we celebrated when the boring machine finally peeked out near the River, behind the Supreme Court of Canada building. The tunneling of the east-west corridor is expected to be complete this fall, and we look forward to commissioning the CSST in 2020. This important project will significantly reduce the amount of pollutants that make their way into the Ottawa River – helping us keep our drinking water clean and our beaches open for residents to enjoy. In the last term, we strengthened the City’s green building policy, in order to reduce greenhouse gas emissions and water consumption. We now have 27 LEED-certified buildings – with six others currently undergoing certification. And going forward, all new buildings will have to achieve a LEED Gold standard, starting at the design phase. We invested one million dollars every year to implement energy retrofits – projects that are good for the environment and generate cost savings. We also approved a new policy for electric charging stations on City property, and converted 36,500 streetlights to energy-efficient LED technology. We all know Ottawa as a green city with plenty of parks and trees – but there’s always room for improvement. Over the last four years, our tree-planting initiatives were a success, and working with our partners at Tree Ottawa, we made significant progress to reverse some of the devastation caused by the Emerald Ash Borer. Which is why in the last campaign, I committed to planting 500,000 trees during this term of Council. This will help us grow our precious urban forest and assist in our efforts against climate change. We will first dedicate a greater percentage of trees the communities that were hardest-hit by tornadoes this past September – like Arlington Woods, Dunrobin and Greenboro – so they may regain some of the thousands of trees that were lost during these terrible storms. Secondly, I will ask staff to target City parks that could use some much needed shade for families and children enjoying our public spaces. I will also work with Councillor Moffatt – as Chair of the Environment and Climate Protection Committee – to bring in some of the toughest tree protection bylaws and penalties in the country. We will ask the Province to give us permission to triple the current penalties – which could lead to minimum fines of $3,000 and maximum fines of $300,000. No longer will developers or enterprising residents have ‘’oops’’ moments and a slap on the wrist after cutting significant trees during construction projects. This year, we will also make important progress on enhancing the voice of women at City Hall. On March 8, in celebration of International Women’s Day, I will have the pleasure once again of welcoming over three hundred of our city’s leading women for a breakfast at City Hall. This year’s breakfast will mark a first – as I will be joined by Council’s new Liaison for Women and Gender Equity. Councillor Kavanagh and I will take this opportunity to launch the City’s Women and Gender Equity Strategy. It will also be a first because – as part of governance in December – Council committed to ensuring gender parity on its advisory committees and boards. I’m pleased to report that – through this year’s selection process – we are well on our way to achieving 50/50 parity on the advisory committees and boards that have already selected their members. I look forward to working with Councillor Kavanagh and the many women who will find a voice at City Hall to ensure their perspectives can be heard by both Members of Council and staff. Nous faisons aussi des progrès constants pour offrir plus de services à nos résidents et familles francophones dans tous les coins de la ville. L’an dernier, Sports et Loisirs ont établi un partenariat important avec Retraite en Action pour offrir plus de programmes francophones aux aînés dans l’ouest de la ville. Cette année, je suis fier qu’ils commenceront à offrir nos programmes et camps d’été francophones dans le secteur rural d’Ottawa, comme à Osgoode et Metcalfe. Grâce au travail acharné du Conseil des écoles publiques de l’Est de l’Ontario, plusieurs groupes communautaires pourrons enfin desservir leur clientèle dans ce carrefour francophone. Et à l’hôtel de ville, les plaintes quant aux services en français ont encore diminué l’an dernier – passant de 47 en 2017 à 34 en 2018 – une baisse de plus de 27 pourcent. et le pionnier de la communauté franco-ontarienne d’Ottawa – Ronald Caza. I hope you will join me to pay tribute to these most accomplished residents who have changed the face of our city. And indeed – our city is evolving, and it’s changing for the better. I am thankful that we will have four years to work together to tackle these many challenges and improve the lives of our residents. I know Ottawa’s future is bright. I look forward to working with all Members of Council throughout the course of this term to continue this progress. Let’s all work together towards an even better Ottawa. Previous: Previous post: Elgin Street – Let’s support our businesses!